Already for a long time chief officials of the Russian ministry of culture continue their systematic activities on the destruction of the public Museum named by N.K.Roerich, founded by a Russian public organization "International Centre of the Roerichs (ICR)". Museum named by N.K.Roerich in Moscow is the biggest public museum in Russian Federation. Its founder is the younger son of the great Russian artist Nicholas Roerich - a famous artist and well-known public figure Dr. Svetoslav Roerich, citizen if India. In order to create this Museum he proposed to transfer, free of charge, the heritage of his parents, that has world-wide importance (hundreds of paintings by the Roerichs, their library, unique archive, valuable rarities), from India to Russia. 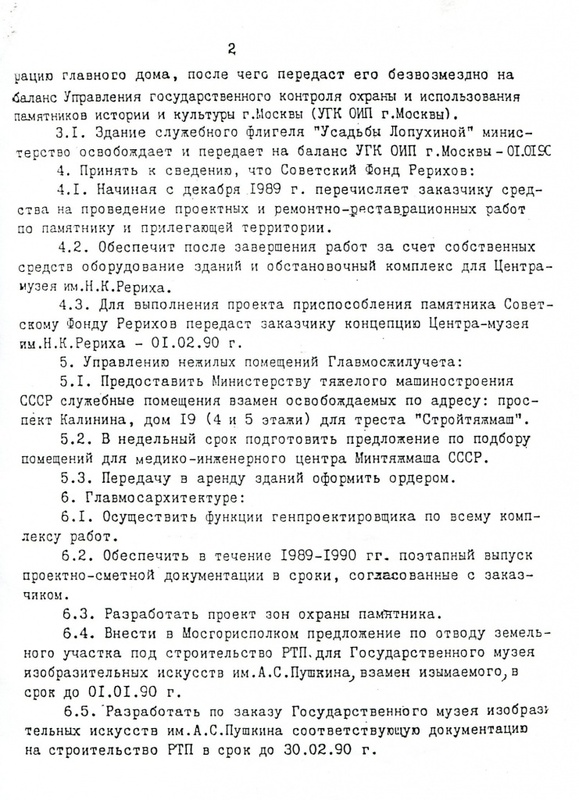 Foundation of the exactly public Museum, "not managed by the Russian ministry of Culture or, more than that, by the State Museum of Oriental Arts" (http://lib.icr.su/node/11, http://en.icr.su/protection/heritage/documents/we-cannot-linger.php), Dr. Svetoslav Roerich saw as the only correct and acceptable condition of the free-of-charge transfer of the Roerichs heritage to Russia, to the founded by him public organization "Soviet Roerichs Foundation", that in 1991 was converted into the International Centre of the Roerichs. In accordance with the will of Dr. Svetoslav Roerich Lopoukhin's estate was given by the state government for the future Museum. The state government accepted the conditions of Dr. Svetoslav Roerich. 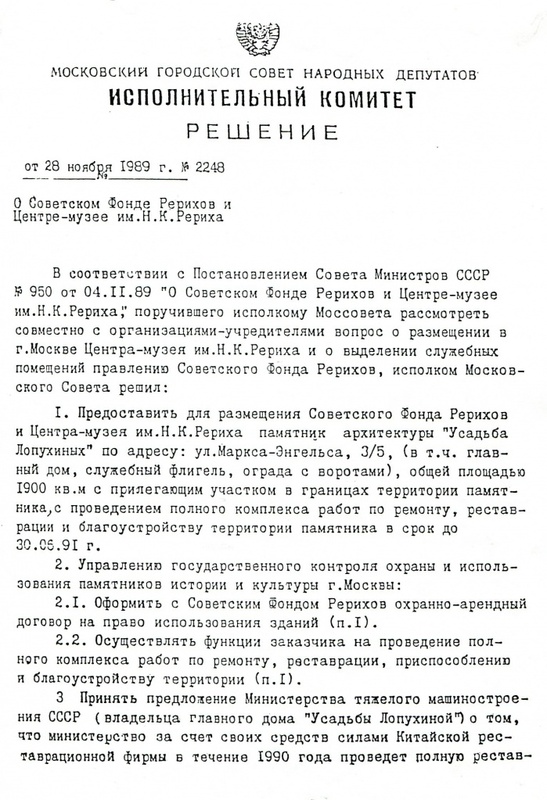 The state warranties were secured by the state government regulation № 950 from 04.11.1989 (http://lib.icr.su/node/13, http://en.icr.su/protection/heritage/documents/resolution.php) and by the Moscow government regulation № 2248 from 28.11.1989 (page 1 / page 2 / page 3). In 1990 Dr. Svetoslav Roerich passed the Roerichs heritage to the Soviet Roerichs Foundation (Testament of Dr. Svetoslav Roerich "Archive and heritage of Roerich for the Soviet Roerichs Foundation at Moscow" / Russian translation), that after the disintegration of the Soviet Union was transformed into the International Centre of the Roerichs, to which Dr. Svetoslav Roerich transferred all rights on the heritage (Addendum to the testament from 22.10.1992). In 26 years of its activity the International Centre of the Roerichs evolved into the world's largest centre on the preservation, study and popularization of the Roerichs heritage. Its activity was held without any financial aid from the government or official structures. With the help of people's donations and support by Maecenases the Centre of the Roerichs conducted the unique restoration of the half-destroyed Lopoukhin's estate - an architectural monument of the XVII-XIX centuries, and created there the public Museum named by N.K.Roerich. This work was honored by high state and foreign awards, like the European Union international award, presented by the all-European federation of the cultural heritage preservation "Europa Nostra", in the "Dedicated Service" category. For the outstanding achievements in preservation of the Roerich heritage and development of the museology the general director of the Museum, Dr. Lyudmila Shaposhnikova was awarded the Order of Friendship and the Order "For Merit to the Fatherland" IV class by the President of Russian Federation. The public Museum of the International Centre of the Roerichs is equipped with the most modern facilities for storage and preservation of the Museum objects. Its collection consists of more than 3000 items of the Roerichs heritage, 900 paintings among them. Museum has the world's biggest collection of the Roerichs paintings and their archive with about 13000 items. The international Centre of the Roerichs became the world's leading organization on the cultural heritage protection, based on the peacemaking ideas of the Roerich Pact - the first international Pact on the worldwide cultural heritage protection during time of peace and war. During the last 3 years international exhibition projects of the ICR, dedicated to the Roerich Pact, were held in 117 cities of Russia and in 54 cities of 17 countries abroad, in the United Nations General Assembly in New-York, UNESCO headquarters in Paris, The National Senate of Argentina and the Palace of Peace in Hague among them. Peacemaking activity of the ICR and its Museum was highly appreciated by the UN Secretary-General Ban Ki-moon and was supported by the UNESCO Director-General Irina Bokova. On June 10th 2015 Irina Bokova personally visited the public Museum by name of N.K.Roerich to honor the activities of the ICR on the preservation of culture and peace. Irina Bokova noted many times, that the peacemaking activity of the ICR corresponds the UNESCO's mandate and adds valuable input into the protection of culture and peace (http://www.icr.su/rus/news/icr/Pact_project.php, http://en.icr.su/news/Pact_project.php). The public Museum named by N.K.Roerich has become a real national treasure of Russia, and the International Centre of the Roerichs - the guarantor of its secure existence and preservation of the Roerichs heritage. The President of the ICR is the distinguished conductor Yury Temirkanov (http://en.icr.su/news/index.php?news=4487). The board of trustees of the public Museum includes other famous personalities of the Russian culture and science - Anatoly Karpov, ex-world chess champion, Michael Gorbachev, ex-president of the Soviet Union. The board of trustees previously also included Mstislav Rostropovich (famous musician and conductor), Dmitry Likhachev (famous leader of culture), Evgeny Primakov (famous statesman) (http://en.icr.su/about/trustee/). In 2016 the ICR was nominated for Nobel Peace Prize for its peacemaking activity on the protection of the cultural heritage, based on the ideas of the Roerich Pact («Postimees» newspaper (Estonia), 16.02.2016). In the same time the current officials of the Russian ministry of culture, in faces of the minister Vladimir Medinsky and its deputy Vladimir Aristarkhov, make efforts to destroy the Museum, take away the buildings and the museum fund against the will of Dr. Svetoslav Roerich. Their aim is to get the museum fund into the government administration and to control it according to their own mercenary plans. Having no rights on the Roerichs heritage, transferred to the ICR, being not able to prove the rights of state on it in the court, the ministry of culture tries to reach their goal with pressure and dictate, to justify their raider behavior. 1. November 2013. Minister of culture Medinsky writes a letter to the President V. Putin, in which, heavily distorting facts about the ICR, asks to protect the interests of state in the sphere of the Roerichs heritage. In the result the previous court decisions, that recognized the ICR as the heir to the Roerich heritage according to the will of Dr. Svetoslav Roerich, were cancelled (letter from 11.11.2013 №4704 - 01-07-ВМ). 2. The business of the main Maecenas of the ICR is destroyed by the state activities, and the Museum looses its financial support. 3. First deputy minister of culture V. Aristarkhov sends numerous letters to different state authorities in order to organize mass inspections of the international Centre of the Roerichs and its Museum, based on fictional reasons. Only during the second half of 2015 5 inspections were organized from the prosecutor's office: one - on the possibility of illegal exportation of the Roerichs heritage abroad, three - on the illegal possession of the Roerichs heritage, one - based on anonymous delations, where the Museum workers were said to be ready to put Kremlin to fire (!!) with bottles with Molotov cocktail (Letters by the prosecutor of the Khamovniki Moscow region E.Puzanov: from 27.05.2015, 30.09.2015, 29.10.2015 and 20.11.2015). - Conclusion by I.B.Khmelnitskaya, member of workgroup on inspection of the International Centre of the Roerichs by the Khamovniki region prosecutor's office. As the result, no theft, no attempts of illegal exportation for sale were discovered. It was also not proven, that the ICR possesses the Roerichs heritage illegally. Qualified specialists from the ministry of culture, that took part in the inspection commissions from 24 of November 2015, visited all rooms of the ICR, where the Roerichs heritage is being conserved, checked all accounting and working documents on the heritage. It was stated by the commission, that "no serious violations were detected" and "the storage conditions do correspond the accepted standards and rules of accounting and conservation of museum items". It was noted, that not all state museum have such perfect conditions of museum and archival items conservation, such safety and security system, as in the ICR. 4. Up to the autumn of 2015 the buildings of the Lopoukhin's estate were used by the ICR on the basis of long-term rent, and from 2014 - of free-of-charge rent. In November 2015 the ministry of culture forced the transfer of the buildings from the property of Moscow into the state property and then gave them into operating management of the museum of Oriental Arts, well-known for the disappearance of the Roerich's paintings from their funds (Journalist investigation "Scary story of the Oriental museum/ "Novaya Gazeta", 20.07.2009, № 77; Roerichs paintings disappeared. Ministry of culture keeps silence. http://www.newizv.ru/culture/2015-09-11/227093-kartiny-rerihov-propali-ministerstvo-kultury-molchit.html // Novye izvestia. 11.09.2015). 5. On February 16, 2016 at the board of ministry of culture Medinsky raises the issue of formation of the state museum of Roerichs in the Lopoukhin's estate, as a branch of the museum of Oriental Arts. Ministry of culture wants to spend 36 177 696 roubles (about 560000 USD) on this in 2016 (link). So a logical question arises: "Why to spend such amount of budget money on formation of a state museum in the Lopoukhin's estate, when in these very buildings already for many years successfully functions the public Museum, not requiring any financial expenses?" In the same time in the storerooms of the Tretyakov Gallery and the Russian Museum in Saint-Petersburgh remain large collections of the Roerich's paintings, that for decades are not shown to the public. But, contrary to the common sense, ministry of culture wants to "form" the new museum not from the existing in the other state museums funds, but from the buildings and funds of the public Museum named by N.K.Roerich of the International Centre of the Roerichs. To participate in the formation of the new museum in the Lopoukhin's house Boris Mazo, the head of the estate management and investment policy department of the ministry of culture was appointed, who in the same time was responsible for historical monuments management and usage agency. Currently, he is arrested under investigation of theft of budget funds (http://www.ntv.ru/novosti/1614898). 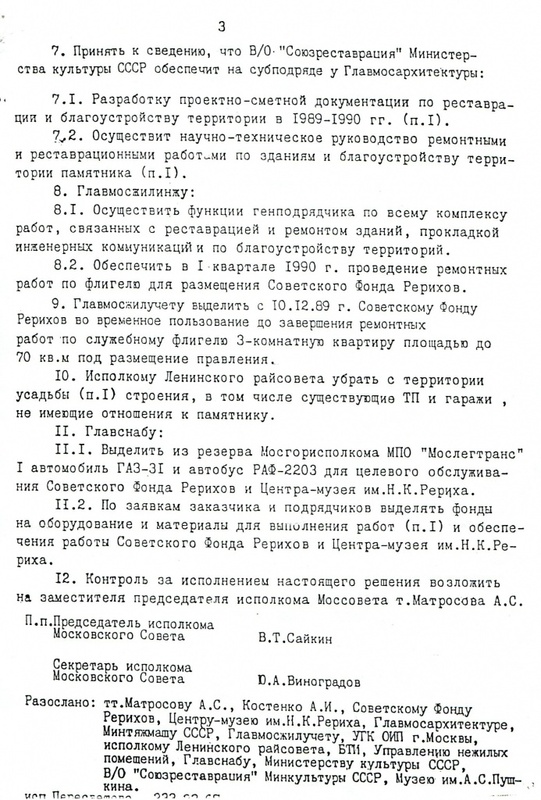 The activities of Boris Mazo were controlled by the first deputy minister of culture, the mentioned above V.Aristarkhov, who, together with his brother A.Aristarkhov, the chief of OJSC "Restoration companies" is also being investigated on illegal expenditure of budget funds (http://www.rbc.ru/politics/20/05/2016/5734921e9a7947cc10e9813d). 6. In may 2016 the state museum of Oriental Arts send a notice to the ICR on eviction from all buildings of the Lopoukhin's estate (buildings 4, 5, 7) and applied to court on eviction from building number 5. 7. V.Aristarkhov continues his flow of letters to the state authorities. In 2016 the ICR was inspected already for 6 times: by the tax and labor inspections, Moscow land committee, Ministry of Home Affairs. In June, on the request of V.Aristarkhov, the Department of Justice started an inspection of the ICR on extremism and presence of foreign agents (http://www.svoboda.org/content/article/27732341.html). 8. In the end of May 2016 V. Aristarkhov raised an issue to the Moscow government to transfer the land of the Lopoukhin's estate to the museum of Oriental Arts and to demolish the Buddhist Stupa of the Three Jewels (the only canonical Stupa in the Moscow region) and the Roerichs monuments, that were built on the estate territory on the people's donations for the memorable dates (http://en.icr.su/news/index.php?news=4690). For two years the ministry of culture spreads negative information about the ICR in all authorities, accusing this established and biggest public cultural organization in Russia for contradiction with state authority, forming its image as of scandalous, claiming the state property, and depicting the Roerich public organizations of Russia, that actively support the preservation of the public Museum, also as antagonistic to the state. On the change.org website the petitions to save the public Museum named by N.K.Roerich gathered already about 200000 supporters. But this has no effect on the governmental officials. Petition on Change.org: Do not allow the destruction of the public Museum named by N.K.Roerich! Petition on Change.org: Accomplish the will of Dr. Svetoslav Roerich - Save the Nicholas Roerich Museum in Moscow!